Our 2018 main production will be 9 to 5 the Musical, featuring the music of Dolly Parton and based on the film of the same name. 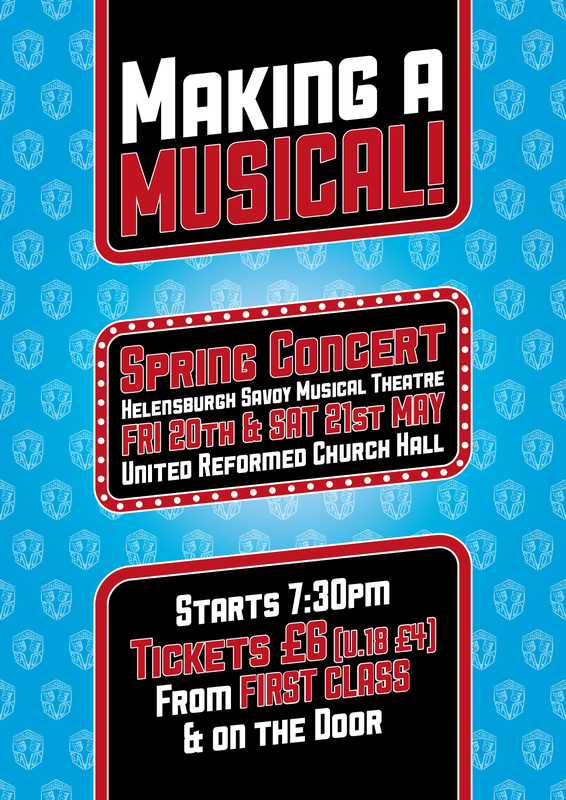 Rehearsals start Wednesday 16th May, 7:30pm in St Michaels Church hall on William street, Helensburgh. Auditions will be held for principle parts on Wednesday 6th June. 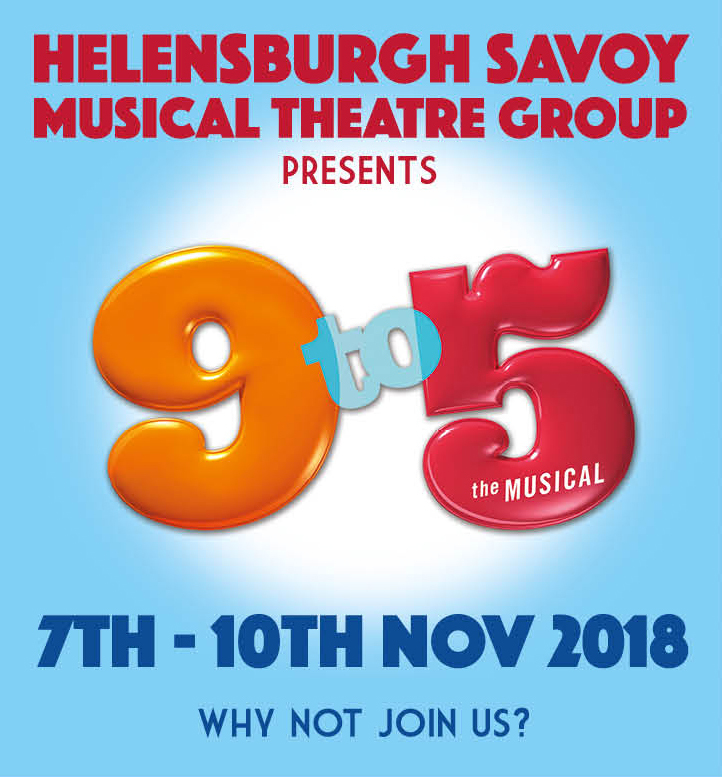 If you cannot make pre-audition rehearsals, please pre-register for auditions by emailing info@helensburghsavoy.org.uk to receive the audition pieces. The production will be in the Victoria Halls, Helensburgh from the 7th-10th November 2018. This years spring concert was a great success, with the a new format and venue working very well. We even had a sell-out audience! We are already planning to repeat the format next year and potentially going back to two performances rather than one. Photos from the concert can be found on our facebook page. Thank you to everyone that came to support out run of Sister Act in November 2017 at the Victoria Halls, Helensburgh. Audience reviews were positively glowing with several seasoned viewers and former club members saying it was our best ever production! 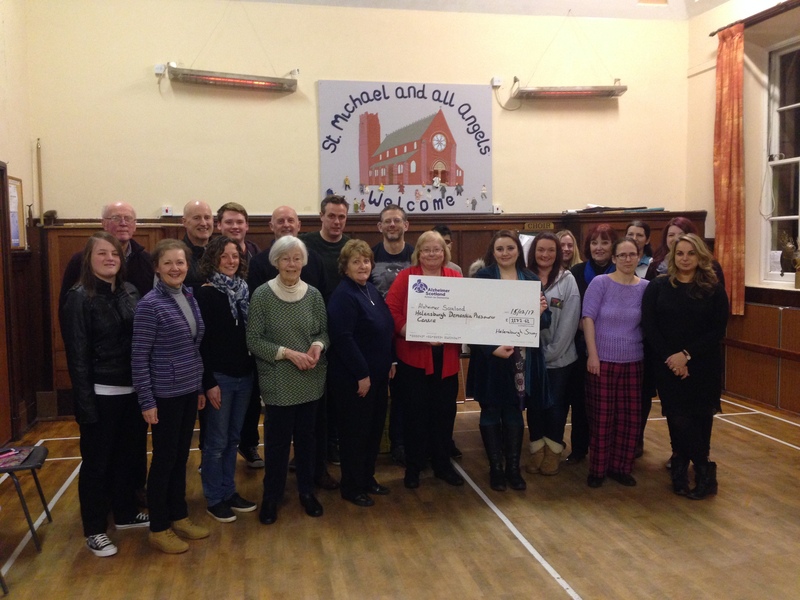 Thanks also to everyone that came to perform in and support our annual charity concert, this year in aid of the C.H.A.S. operated Robin House Children’s Hospice in Balloch. We’re happy to announce that the sum of £1100 will be donated to the charity. Our annual big quiz night fundraise for the club is moving into the spring this year. Held Friday 16th March in our usual venue, the United Reform Church Hall on West Princes St, Helensburgh. Entry £3 p/p with teams of up to 6, entry paid on the door. Bar & raffle. Rehearsals are underway for this years spring concert which is ringing the changes with a new format, new venue and a return to being a 1-night-only performance. The aim is to mix things up and add some more performance and dance into the mix, while keeping the usual wide array of songs from musicals and cinema. The date for the cabaret evening (new name still to be decided) is Friday 11th May, from 7.30pm at St Jospeh’s Church Hall, Helensburgh. Tickets should be available by late April. 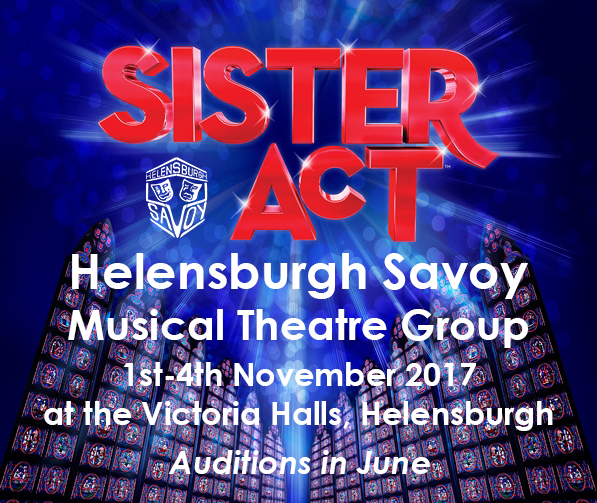 Sister Act will run from the 1st-4th November 2017 at the Victoria Halls, Helensburgh. Direction by Claire Love & Musical Direction by Pamela Frew. Thank you to everyone who came and supported the club for our two successful Spring Concert performances at the end of May. Thank you to everyone who came and made our annual charity concert such a great evening. We are pleased to announce that we raised £1,172.62 for Alzheimer Scotland. Thanks again to all the local performance groups and audience members for taking part in this event. As you may have already seen on our facebook or in the local press, our autumn show this year will be Sister Act. This great hit modern show will run from the 1st to the 4th of November 2017 in the Victoria Halls, Helensburgh. Auditions will be held in June with details to be announced in the local press and on facebook nearer the time. Some of you may know that we have, for the past couple years, had access to a room in an unused council property for our costume and props storage. Due to a change in personnel at A&B, we only discovered last week that the building was about to go on the market and we had 1 week to vacate! After much brain wracking among the committee and an appeal to club members for options, Minuteman Press on John Street in Helensburgh agreed to step in in the short term and give us some of their upstairs space. A huge thanks to Richard and Jane for saving us from the big hassle of, worst-case-scenario, having to divy the costumes up among committee members houses! In the meantime we are still searching for a more suitable permanent home (ideally rent free!) so any ideas, do please get in touch. 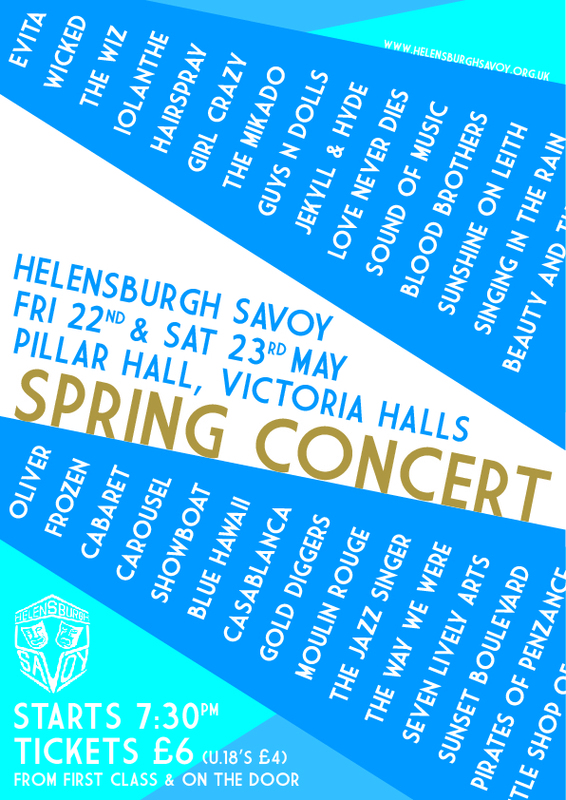 Spring Concert – 19th & 20th May, in the URC Hall in Helensburgh. Tickets available from the start of May. 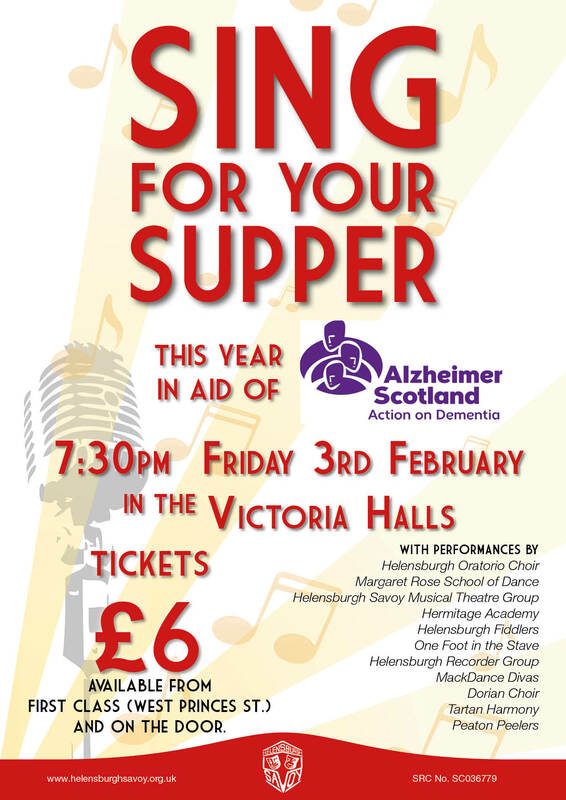 Our annual charity concert, featuring performances by over a dozen local performance groups, will be raising funds for Alzheimer Scotland. Tickets £6 available from First Class, Helensburgh and on the door. The AGM was held on Wednesday 11th January with the following appointments to the club committee. Ordinary Members (min 3): Euan Forrest (returning), Frances Rapallini (returning), Mark Trick, Emily MacGillivray. 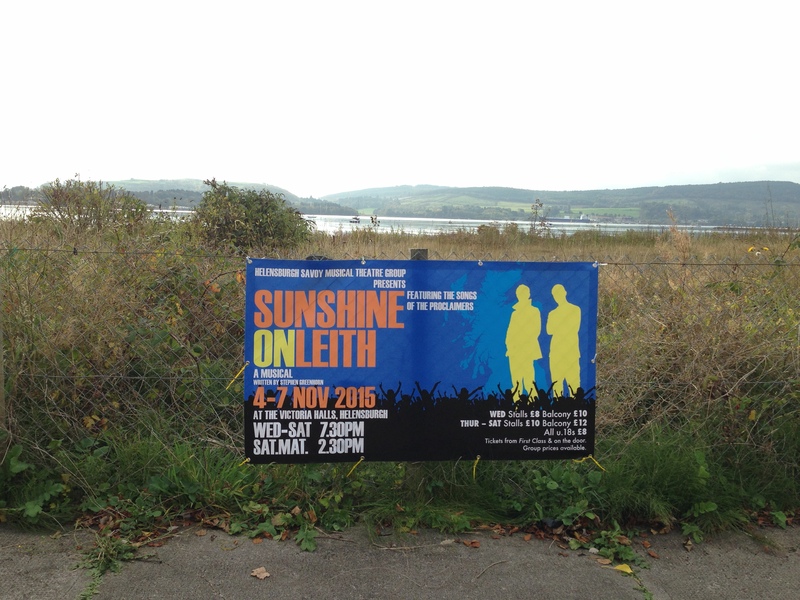 Posters and banners are up around the town and tickets are available from First Class, W.Princes St, Helensburgh. There are still a number of smaller parts to be cast and this will happen once rehearsals are fully under way in August. Thank you to everyone who came and supported the club for our two Spring Concert performances at the end of May. An album of photos from the Friday evening is available here on the clubs Facebook page. The social picnic and duck race fundraiser is on the 20th June and everyone is encouraged to come along and join in. This years Spring Concert will feature a tour of the whole history 150(-ish) years of musical theatre, from the early music halls right up to the latest hits of stage and screen. With music from the likes of Evita, Iolanthe, Little Shop of Horrors, Guys N Dolls and Frozen, to name just a handful. Tickets £6 (£4 u.18) available now from First Class, Helensburgh and on the door. 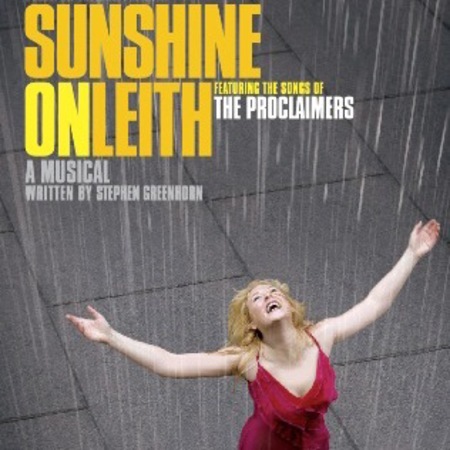 Helensburgh Savoy Musical Theatre Group will be holding Open Auditions for principal roles in their upcoming production of Sunshine on Leith, the lively musical based on the songs of The Proclaimers. Our Director this year will be Gemma Davidson, who returns to us having previously directed us in Fiddler on the Roof. And we are delighted that Pamela Frew has again agreed to act as Musical Director this year. 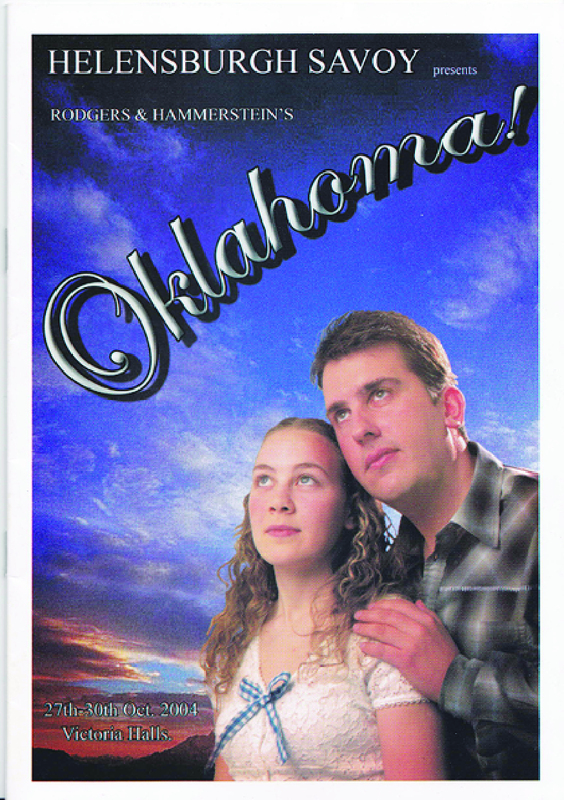 The production will run 4th -7th November. Auditions will take place on Wednesday 3rd June, from 7.30pm, in St Michael’s Church Hall, Helensburgh. Anyone wishing to audition must register their interest on the 27th May by attending rehearsal at 7.30pm at the same venue. A pre selected song and piece of dialogue will be issued according to the roles being auditioned for. Those wishing to join the chorus need not audition but are encouraged to come along on the 27th also. Thank you to everyone that performed in and supported our annual charity concert, this year we raised £850 for Erskine Veterans Hospice. 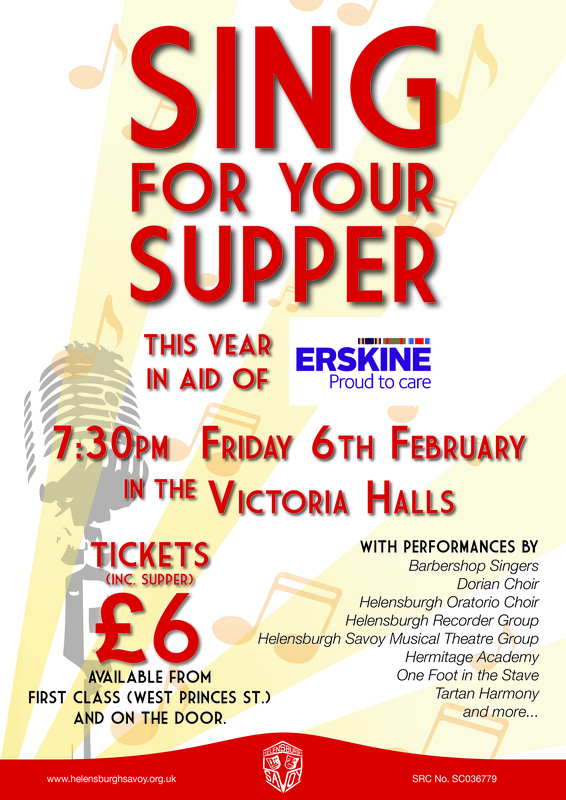 In 2015 our annual charity concert, featuring performances by over a dozen local performance groups, will be raising funds for Erskine Veterans Hospice. The AGM was held on Wednesday 14th January with the following appointments to the club committee. The committee would like to thank Paul Lyden, who is retiring both as treasurer and from the club, for his work in recent years helping steer the club through a financially difficult period. 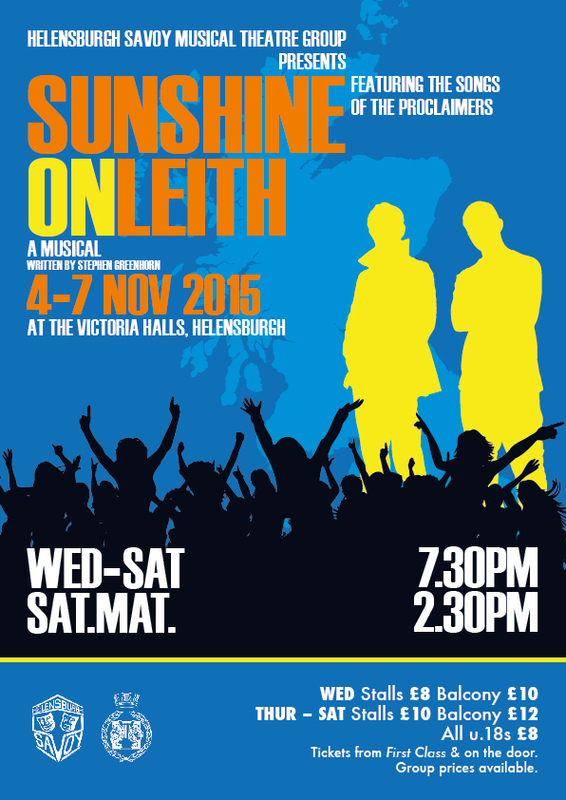 Helensburgh Savoy are pleased to announce that our 2015 production will be Sunshine on Leith.